As of January 1, 2016, standards for excavation in Alaska are enforceable by the Pipeline and Hazardous Materials Safety Administration (PHMSA). The enforcement program protects the public from the risk of pipeline ruptures caused by excavation damage. Should an excavator operate in violation to 49 CFR parts 196 and 198, they may face civil and or criminal penalties under this new rule. More information about the PHMSA ruling can be found at http://www.phmsa.dot.gov/. Click HERE to download a PDF version of the following excavator and contractor excavation safety requirements. For contractors and excavators, it all boils down to four words: CALL BEFORE YOU DIG. There are millions of miles of natural gas and other pipelines as well as telecommunications and power lines underground throughout North America. 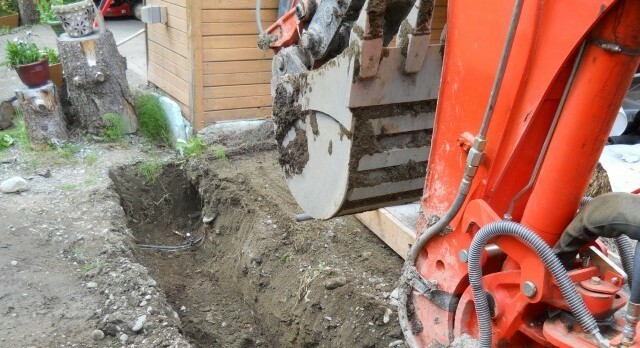 Excavation equipment is one of the leading causes of damage to pipelines. Hitting a pipeline can result in serious injuries and fatalities. Alaska is no exception to these statistics — over half of the damages made to ENSTAR’s distribution system last year were from excavators and contractors. So, whether you’re working with a shovel or a four-ton backhoe, you must make damage prevention your number one priority. Everyone who excavates or digs must do their part to ensure that underground facilities are located before digging begins. Call before you dig — it’s your responsibility, and it’s the law. Your family, friends, and neighbors will thank you! Whether you are a private homeowner installing a mailbox or a professional contractor digging up a city street, you are required by law to notify your local one-call utility notification center at least two days prior to digging. It’s a free service that helps save lives and property damage. There are an estimated 400,000 incidents each year in which careless excavation causes pipeline damage and endangers lives — don’t be one of them! If you hit a natural gas service line that has an Excess Flow Valve (EFV), the gas will blow for a short duration and then shut off automatically if the flow of gas is sufficient to close the EFV. Damages that do not sever the service line completely may not cause the EFV to close and gas will continue to blow. Regardless, you must contact the emergency line to report any damage immediately. EFVs are designed to allow a small amount of gas to escape so they can be reset without excavating to the gas main. Backfilling a damaged service line with gas bleeding underground is extremely dangerous and could fuel an explosion if it is not repaired timely. Do not assume a damaged service is dead or abandoned if it is not blowing gas — the EFV may have shut down the flow of gas. The vast majority of ENSTAR service lines WILL NOT have an EFV. If you damage a service line without an EFV, gas will blow at full line pressure until ENSTAR can arrive to shut it off. Your best protection against damaging underground utilities is to call 811 for locates and hand dig within 2 feet of locate marks. Line Locating is a Free Service: To request a locate, call 811 two days before the scheduled excavation for free locates. Failure to call is a violation of state statutes and could result in fines well in excess of the cost of the damage. Hand digging is advised when excavating within two feet of a marked facility. After ENSTAR has field-marked with yellow paint, or flagged the location of an underground facility, the excavator is responsible for maintaining the markings. Support for Steel Line Crossings: If an excavation below a steel gas pipeline leaves the pipeline unsupported for a distance of more than 20 feet, the excavator must provide additional support for the pipeline. Support must be provided in a way as to not damage the pipe or its coating during construction, backfill placement, and compaction. Generally, a support spacing of five feet or less will provide the needed bracing. ENSTAR must approve all excavations crossing steel pipelines larger than 4-inch in diameter. If support is required, ENSTAR written approval is required prior to beginning construction. Contact the Engineering Department for further information. Extra care must be taken when geotextile fabric and/or rigid insulation are used. In addition to continuous support under the pipeline, compacted fill material shall be placed between the geotextile fabric/rigid insulation and the pipeline. Failure to properly protect ENSTAR’s facilities could result in future damage if differential settlement occurs. Support for Polyethylene Line Crossings: If an excavation is below a polyethylene gas pipeline the excavator must continuously support the pipeline during construction, backfill placement, and compaction. Geotextile fabric and/or rigid insulation shall be sufficiently separated from the polyethylene gas pipeline to prevent undue stress during the compaction/settlement process. Excavation Parallel to Pipeline: When parallel excavations are expected to expose or undermine sections of pipeline, the excavator must notify ENSTAR engineering in advance. Care must be taken not to damage the pipeline, or to induce stresses due to differential settlement following construction. Long parallel excavations exposing pipelines can be very dangerous if not properly performed and shall not be attempted without prior approval by ENSTAR. Contact the Engineering Department for additional information. Blasting: All blasting done within 500 feet of any ENSTAR facility shall be reviewed by ENSTAR. Appropriate measures (i.e. require minimum distance from facilities, minimize blasting charge intensity, etc.) shall be taken to protect the integrity of ENSTAR’s facilities. A leak survey shall be performed before and after any blasting, including all ENSTAR facilities within 500 feet of the blasting. Trenchless Excavation (Vertical or Horizontal): Trenchless excavation is defined as drilling, directional drilling, boring, pile installation etc. Whenever a trenchless excavation (vertical or horizontal) is performed within five feet of a distribution pressure pipeline or ten feet of a transmission pressure pipeline, the gas pipeline must be exposed to visually determine the exact location. If the trenchless excavation is expected to cross the pipeline within the aforementioned distances, the pipeline shall be fully exposed at least one foot beneath the pipeline prior to the expected crossing to ensure the pipeline is not been unduly damaged due to ground movement. When a trenchless excavation runs parallel to a gas pipeline, the pipeline must be exposed at intervals of 25 feet or less to visually determine the pipeline’s exact location. Clearance: Natural gas pipelines require a 12-inch minimum separation from other underground structures not associated with ENSTAR’s pipeline system. Additional clearance from other underground structures may be required to allow proper maintenance and reduce the possibility of damage due to the proximity of other structures (49 CFR § 192.325.). This clearance requirement includes rigid insulation and geotextile fabrics. ENSTAR requires a 36-inch minimum separation from certain electrical facilities, including any grounded components i.e. ground rods, non-insulated conductors and associated structures. Pipeline Cover: ENSTAR pipelines in public rights-of-way are generally installed 36 to 48 inches underground. In private rights-of-way pipelines are buried 12 to 36 inches underground. However, these depths should not be assumed by anyone after installation due to projects that decrease or increase ground cover. Any work that removes ground cover in excess of 60 inches must receive prior approval from ENSTAR. ENSTAR has limited ability to prevent the removal of cover over gas pipelines. Increasing pipeline cover more than five feet or decreasing pipeline cover to less than three feet may be considered a damage that could result in relocation of the gas pipeline at the expense of the excavator. The excavator is responsible for any damage to ENSTAR pipelines regardless of the depth at which they are encountered. Inspection and Standby Requirements: All excavations in the immediate vicinity of ENSTAR facilities (including backfill, compaction, temporary support, and shoring), are subject to prior approval and inspection by ENSTAR personnel. Transmission pipeline inspections are provided whenever an excavator is working within ten feet of a transmission pipeline. If it is determined that an excavation either by hand or machinery was done within five feet of an ENSTAR main line or ten feet from an ENSTAR transmission line without locates or a qualified ENSTAR personnel standing by, ENSTAR reserves the right to excavate the pipeline to determine if any damage was done to ENSTAR facilities. If damage occurred ENSTAR has the right to charge the excavator for repairs.